Steve "slug" Russel had been helping McCarthy write a Lisp interpreter for one of the main mainframes on the campus, when he saw Minsky's program. Returning home to the Hingham Institute (what Steve and his roommates J. Graetz and Wayne Witanen called their tenement) and started discussing about writing a program that really showed off the PDP-1's capabilities. They had already been discussing some kind of display program that was science-fiction themed. And now McCarthy's program had expanded the possibility. It should involve the onlooker in a pleasurable and active way -- in short, it should be a game. With the Fenachrone hot on our ion track, Wayne said, "Look, you need action and you need some kind of skill level. It should be a game where you have to control things moving around on the scope, like, oh, spaceships. Something like an explorer game, or a race or contest... a fight, maybe?" "SPACEWAR!" shouted Slug and I, as the last force screen flared into the violet and went down. The basic rules developed quickly. There would be at least two spaceships, each controlled by a set of console switches ("Gee, it would be nice to have a joystick or something like that..."). The ships would have a supply of rocket fuel and some sort of a weapon: a ray or beam, possibly a missile. For really hopeless situations, a panic button would be nice... hmmm... aha! Hyperspace! (What else, after all, is there?) And that, pretty much, was that. Almost. Steve was also pretty lazy when it came do getting stuff done. And after some of the other PDP-1 hackers heard about his plan for Spacewar and saw him doing nothing with it, they got on his case. Steve's response? Among several different excuses, his main one was he didn't have a sine-cosine routine that would be necissary to plot ship movement, and it was to complicated for him to sit and start figuring out. One of the other hackers by the name of Alan Kotok provided the solution. The MIT hackers had already had a working relationship with DEC, since much of their pioneering software was being given to DEC to distribute freely with the PDP's they sold. This informal relationship also helped when the hackers needed new parts for the PDP-1 or other assistance, and this time it proved to be no exception. Alan found someone at DEC with a sine-cosine routine, plopped it in front of Steve and said "Here you are, Russell, now what's your excuse?". With no more excuses Steve set about programming. Starting in December of 1961, by January he had a small dot that you could move around by flicking switches on the conrol panel of the PDP-1. He then evolved the shape of the ships themselves, coming up with a shape table routine who's concepts are still in use in today's 3D games. He decided to make one cigar shaped and the other like a thin tube to help differentiate the two ships, though both were modeled after classic images of space ships popular in the science fiction of the time. Next he worked on the torpedo's the ships would fire at each other, making them small dots that would fire out of each rocket's nose and travel forward in the direction it was shot - eventually hitting something or fading out. Steve also pionered the idea of collision detection, creating routines to tell when a torpedo and a ship occupied the same place, replacing the ship with a random splatter of lines and dots to simulate an explosion and floating debris. He also added random dots to represent stars as a backdrop, so it was easyer to have a sense of motion on the screen and a frame of reference for positioning. As February came around, he had the basic game done after having caught the "hacker spirit" and not only working during the latenight off hours, but during the regular hours as well. It was at this point though that the other hackers chimed in and contributed yet again. A hacker by the name of Dan Edwards thought you should have to deal with gravity in the game because as it existed now, however was the quickest with the controls would be the one to win. So, he made gravity calculations and added a large star in the center of the screen. The star would draw the ships towards it and destroy them if they got to close. It also allowed different strategies and maneuvers to be developed, such as using the star to help accelerate your ship faster by shooting around it. Graetz added the hyperspace option that worked like a panic button and flung you to some unknown coordinate on the screen. Peter Samson even contributed, and decided to redo the star field. Taking the time to plot every visible star in the night sky between 22 1/2 ∞ N and 22 1/2 ∞ S, he basicly created a computerized planetarium (nicknamed Expensive Planetarium - a joke meaning that this expensive equipment was being used for plotting a bunch of dots). And thus the main code of Spacewar was finished. Almost. Because, as with all the code written by the hackers on both the TX-0 and PDP-1, it was placed in the "public domain" (which basicly meant the paper tape containing the program was stored in a publicly accessible drawer next to the computer), the code was continuously tweaked and different versions of the game started appearing. Such as shots appearing in a hydrolic stream instead of one by one, or random gravity factors, multiple gravity producing stars, and more. The final main addition through were the introduction of actuall controllers. Two people playing Spacewar in the early 1960's. 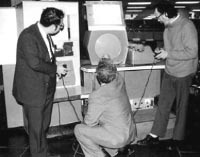 Alan Kotok and Bob Saunders, both originaly from the TMRC contingent, decided to create to create controllers that would allow the hackers to play easyer than they currently had to - basicly squeezing in at the PDP console to get at it's control levers. So, they headed off to the TMRC room, confiscated some switches, wires, and wood, and proceeded to create control boxes. The completed boxes had a horizontal lever switch at the top, a vertical one on the right side, and a fire button towards the bottom left. The top lever was used for right and left rotation, the right lever for accelleration and hyperspace (depending on pulling it towards you or pushing it away), and the fire button of course fired the torpedoes. Finished by April of 1962, it was an addictive hit. When not programming, many of the hackers spent hours playing Spacewar, developing new flight strategies and maneuvers. In a move that mimicked Willy Higginbotam's public display 4 years earlyer, the hackers displayed Spacewar at the MIT open house that May. The people that saw it were shocked, since the most people had been exposed to about computers were large room filled behemoths with blinking lights and men in labcoats scurrying about who spoke another language from mere mortals. Here was a game, written by students, and controlled by a computer. Steve had not realized what he had accomplished until years later in the late 1960's out at Stanford (where he had followed John McCarthy when the latter left MIT) when he and some friends were playing pinball at a local bar until closing time. Afterwords, they went back to the lab and instead of programming they all fired up Spacewar. "These people just stopped playing a pinball machine and went to play Spacewar - by gosh, it is a pinball machine." What Steve had discovered was the entertainment value a computer based game could have, and just what effect his game was to have on people. As with the previously mentioned process, most of the programs written by the hackers were shared with DEC, and Spacewar was no exception. DEC liked it so much that they used it to test each new PDP before it was shipped out the door. With it running, they shut the computer off and because of the type of memory used at that time, it would stay there. So when the PDP reached it's destination, if everything went right in the shipping and nothing was damaged the recipient should be able to turn on the PDP and have Spacewar running right away. With the paper tape copies of Spacewar being freely distributed, by the mid 60's it had been distributed all across the country to colleges and businesses. It even was translated for play on other computers and their formats. Probably the most significant impact of Spacewar however, would be when one Nolan Bushnell played the game while at college in Utah. Working as a manager at an amusement park at the same time, he came to the same realization Steve had. And it culminated in Nolan creating the first coinoperated video game Computer Space in 1971, (which was based off of Spacewar), singlehandedly creating the coinoperated video game indsutry and leading to the creation of Atari and the establishment of video games as we now know it. This period of computer games at MIT forshadowed and set in motion many of the developments to come. Most importantly the "hacker spirit" and do it your self attitude that surrounded the creation of many of the most loved computer and video games. Many consider Spacewar to be the first true computer based game if not the first video game. Whatever the definition, it's impact and the impact of the people involved can not be denied. The muck was swirled, and out crawled a computer game called Spacewar! Next week - Computer based games take a step back in looks but forward in creativty as mainframe "text" based games evolve.